Defining Vino Nobile di Montepulciano wine is almost impossible. Described as the king of the reds, Montepulciano is a full-bodied beverage with a strong character and an ancient history. Appreciated over the centuries for its exceptional quality, Montepulciano wine has inimitable flavors and aromas. Add to this the fact that Vino Nobile is only produced in a limited area and you’ll have a fine, elite beverage to discover. And what tasting place could be better than Montepulciano wine region, the place where this heavenly elixir is produced? Vino Nobile originates from Tuscany, a hilly region in Italy and one of the most famous wine regions in the world. Winemaking was introduced in these lands by the Etruscans, but the first written testimonies date back to the Roman Empire. Montepulciano wine was mentioned for the first time in 789 AD in a document attesting the legality of a vineyard to the local ecclesiastical authorities. Since those early times, Montepulciano evolved, defining its body and bouquet. In 1937 was founded the first social winery which brought together the producers of Vino Nobile di Montepulciano. This marked a new beginning for the wine which received its Denomination of Controlled Origin (DOC) certification in 1966. In 1980, the beverage conquered the higher peaks and received its Denomination of Controlled and Guaranteed Origin (DOCG) certification. Montepulciano was the first Italian wine to ever achieve this prestigious title. Along with this recognition came also the denomination of a new wine, the Rosso Di Montepulciano, which is made from the same grapes but obtain through a different production process. Both Montepulciano wines are produced in the province of Siena, in the municipality of Montepulciano. Low altitudes, mild winters, and sunny summers contribute to defining the characters of these exceptional wines. Montepulciano wine is made from a blend of Sangiovese, locally known as Prugnolo Gentile, Canaiolo Nero, and a few other varieties cultivated in the region but excluding Malvasia del Chianti varietals. According to the DOCG rules, Vino Nobile must contain at least 70% of Sangiovese, while Canaiolo and the other varietals can account for up to 20% each. When white grapes are involved, their percentage cannot exceed 10%. Once fermented, the wine must undergo a maturation period of at least two years, starting from the first January following the harvest. Aging can be conducted in various ways, and the chosen method will impact the organoleptic characteristics of the wine. In all cases is involved a maturation in wooden barrels of at least twelve months. The highest quality of Montepulciano wine is represented by Riserva, a noble wine with a minimum alcoholic concentration of 12.5%. Riserva wine is aged for at least three years in oak barrels and for at least six years in the bottle. 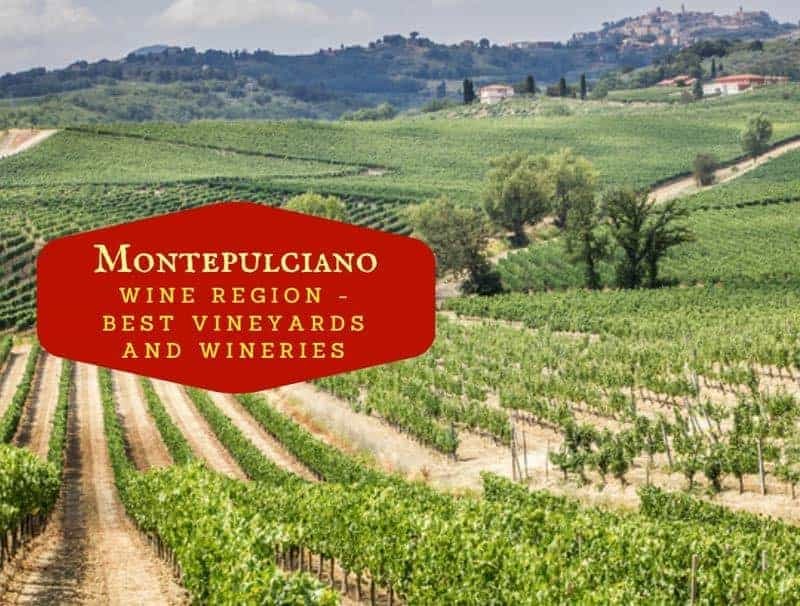 Montepulciano Wine Tasting: What To Expect? Montepulciano wine has a beautiful ruby color that tends to take garnet reflections with aging. The beverage has an intense, ethereal aroma, and a balanced, dry, intense, and persistent flavor. This harmonious complexity has hints of wood, jam, and red fruits. This wine is best appreciated at a temperature between 64.4°F and 68°F. It’s recommended to decant the wine at least two hours before serving and serve in large red wine glasses that capture the bouquet of this fabulous beverage. Montepulciano wine pairs with red meat and game, but also with noble poultry. Its incredible balance also makes it an inspired match with flavorful aged cheeses, such as pecorino or parmesan. Contucci is one of the oldest wineries in Montepulciano, producing Vino Nobile since the sixteenth century. The cellars are even older, dating back to the thirteenth century. Contucci vineyard covers 170 hectares, 21 of which are located at altitudes above 1400ft. The wines are produced exclusively from native vines and the manufacturer’s wines are distributed on the international markets. Preserving the ancient traditions and making wine according to the ancient methods, a visit to Contucci means a trip to the past. The cellars are open every day, including the weekends. Triacca was born in 1897 when Domenico Triacca purchased the first vineyard in Valtellina. Passionate about winemaking, Domenico built his own cellars shortly after purchasing the vineyard, laying the foundation of Casa Triacca philosophy. Over the time, the family dedicated completely to viniculture, extending their horizons to Tuscany. One of their first vineyards in the region was Fattoria La Madonnina, in the heart of Chianti. But fascinated by Montepulciano’s quality, the family purchased Santavenere estate in 1990. Accounting for 36 hectares of vineyards, the Santavenere estate is renowned for its Vino Nobile. But the wine isn’t the only thing to appreciate in this place. With a rustic architecture that blends seamlessly into the landscape, the cellar is equipped with state-of-the-art winemaking equipment and the wines produced here are aged for at least 18 months. Founded in 1937, La Vecchia Cantina di Montepulciano is the oldest wine cooperative in Tuscany. Located in a central position in the Montepulciano wine region, the estate boasts an impressive cellar, traditional warehouses, a store, and other facilities. The winery is equipped with state-of-the-art equipment that allows a close monitoring of the winemaking process. The vineyard extends on about 1000 hectares and the cellar is open for tours from Monday to Friday. Another amazing winery to visit in Montepulciano wine region is Bindella. The estate covers 90 hectares divided between vineyards and olive groves. The estate was purchased in 1983 by Rudi Bindella, who launched her first Vino Nobile in 1988. Since then, the estate evolved and incorporated new winemaking technologies while preserving the cultural heritage of the traditional production methods. The winery is open for visits from Monday to Friday. Characterized by a distinctly modern touch, Salcheto is an organic and biodynamic winery. Its name is given by the willow trees who have a decisive impact on the taste of the wine. The willow trees also create biomass energy which contributes to the autonomy of the cellar, and everything on this estate is related to environmental sustainability. Besides the vineyards and winery, the estate incorporates a wine house with 9 bedrooms and a large socializing area. Sleeping in the ancient building in the heart of Tuscany while sipping a glass of the best Montepulciano wine is undoubtedly an unforgettable experience. Can You Mix Red And White Wine? What Does It Taste Like? Although not having any formal training in wine, Tim has developed an irrefutable love of wine and interest in anything related to it ever since he was a little kid. Coming from a family of wine lovers, it was from a young age that he got exposed to wine and the culture that goes with it and has been addicted ever since. Having traveled to dozens of wine regions across the world including those in France, Italy, California, Australia, and South Africa and tasted a large selection of their wines, it is with great joy that he hopes to share those experiences here and take you along on the journey. Is There Water In Wine? What Percentage Of Wine Is Water? Can Wine And Coffee Be Drank Together? Match Made In Heaven? Does Wine Contain Vitamin C? Is Wine Acidic, Alkaline, or Basic? Wine Turtle is a participant in the Amazon Services LLC Associates Program, an affiliate advertising program designed to provide a means for sites to earn advertising fees by advertising and linking to Amazon.com.